Should You Eliminate Crunches from Your Abdominal Workout? Crunches or sit-ups are one of the first exercises we are introduced to as we are kids, and is naturally one of the exercises many of us are very familiar with. This exercise isn’t one that you should continue to do as you get older though, as more and more evidence points towards the exercise being bad for back. On top of that the exercise itself isn’t even that great for the midsection as it really only targets one specific are of the abdominal, the outer muscles which we know as the 6-pack. It doesn’t target the obliques, or any of the inner muscle tissue either, which can lead to an imbalance and even injury. The fact is that the sit-up doesn’t train the entire midsection and is only an isolation exercise that isn’t sufficient on its own. To best train your core you need to be more diverse in the exercises you’re doing, which will help you get stronger and lose more fat in the process. If planks aren’t already a regular part of your core exercise routine, they need to be. Not only are they one of the most affective exercises in training the entire core, they require no equipment to do and can be done anywhere. On top of that there are so many different variations of planks you could do when traditional planks become too easy for you, making them in exercise you can rely on for long-term core development. This exercise is going to help build your core, build your stability and improve your lifts in other areas as well. This is another great exercise which targets the entire midsection, and one which can be modified to suit anyone. Ideally you want to do this exercise when you are in a standing position without your legs bent with your hands extended to the floor as if you are trying to touch your toes. You then simply move your arms forward with the use of the wheel all to where your body is about parallel to the floor. The key here is to maintain proper posture by keeping your core are in your entire body relatively tight throughout the course of this exercise. If you’re new to doing this exercise or if you’re not too flexible, it can be extremely difficult. If this is the case then you can do the exercise from a starting position at the knees instead of having to bend all the way to the floor. Remember to keep your chin tucked and your pelvis tucked as well to maintain good posture as you progress through the exercise. This exercise is performed similarly to your traditional deadlift, as the form is virtually the same. The difference here is that you are going to be using a dumbbell instead of a straight bar, which is going to be held at your side. The idea behind this exercise is to move as much weight as you can while standing still, which is a quick way to improve core strength. The way to get the most out of this exercise is to overload one side of your body with a lot of weight, which is going to make it more difficult for you to maintain proper posture. Use weights in both hands if you are just starting out to get the hang of the exercise to minimize potential injury. Bodyweight exercises such as push-ups, pull-ups, jump squats, jumping rope are excellent exercises which will test core strength as well. The main advantage to these exercises is that you can do them pretty much anywhere you go, and that your risk of injuring yourself is minimized here as well. These exercises are ones which are going to provide you with needed functional strength as well, which is going to help you not only in other areas of exercise but in sports and in the workplace too. These four workouts all compound exercises which work multiple muscle groups simultaneously in one exercise, and are core strength building exercises to any good routine. All of these exercises require a tremendous amount of core strength to do as well, which helps to stabilize the body throughout the exercise. Being able to lift a good amount of weight while maintaining proper posture throughout any of these four exercises means that you need the right core strength to do so, in turn making these exercises great for core development as well. 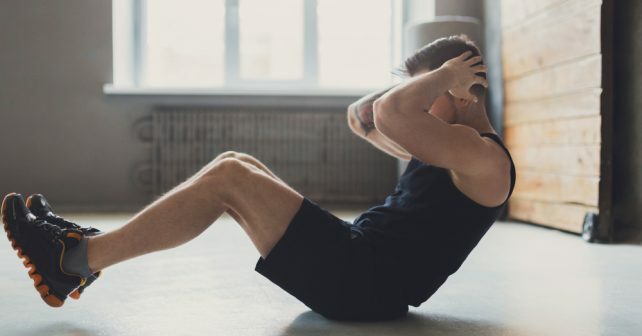 Every single day you should be doing something to improve your core strength, and doing these four exercises can help get you there that much faster. In theory this exercise should be one that is relatively simple to do, as there are very few steps you need to do in order to perform the exercise. With that being said, it is one of the more difficult exercises that people struggle with. This is because this exercise requires a tremendous amount of core strength, and many people find it extremely difficult to maintain proper posture throughout the exercise. To do this exercise you simply need to dead hang from a straight bar, and from there slowly raise your feet, with toes pointing upwards towards the ceiling as high as you can. Make sure to keep your legs straight while doing so, without bending your legs at the knees. You should be doing this exercise as slowly as you possibly can to best work the abdominal muscle, so shoot for 5 to 8 repetitions in this exercise.